on the well-being of YOU. lounging at the beach, and spending time with new friends. together with a yoga party! turtle nesting, and many more! If you don't have a friend to travel with, no problem! There are many wonderful people who are traveling alone on this trip. Please come along, enjoy, and make new friends. or “pure life”, but in Costa Rica it is more than just a saying -- it is a way of life. that reflect the true meaning of ¡Pura Vida!. Pura Vida is the way Ticos live. thankful for what they have and not dwelling on the negative. yoga retreat is to define the true meaning of pura vida. and a New Year’s Eve Yoga Party! $500 non-refundable deposit is needed to secure your spot. Deposit will be applied to the total cost of the retreat. All rooms are shared and the rate is per person. Price per person is $1,575 for vegetarian meals or $1,650 for non-vegetarian meals. Must be paid in full no later than November 1, 2016.
vegetarian meals or $1,500 for non-vegetarian meals. Must be paid in full by July 15, 2016. Cash or check payments are preferred. Please make checks payable to Cicelee Chappelle. For a mailing address, please email: YogaInCostaRica@gmail.com. single rooms available and special pricing will apply. ​Please email us for more information. Ready to go?! 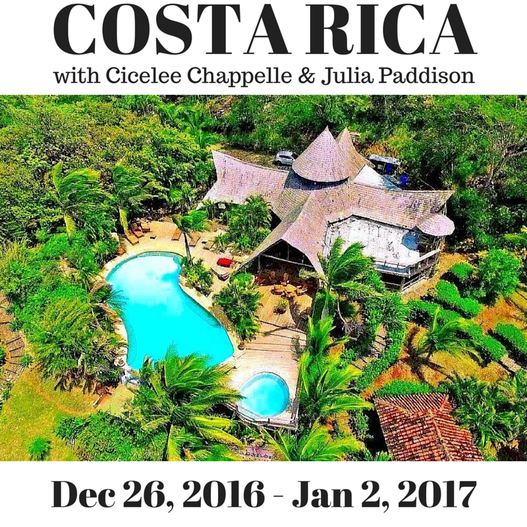 Email YogaInCostaRica@gmail.com to secure your spot!